The temperature has been hovering in the 20’s (or lower) for the better part of two weeks. That, to me, is chowder weather. Though I grew up in Maine and have been back for 18 months, I had never before made a clam chowder. Drawing on elements I like in other versions, with the input of Mom and notes from Homegrown, I put together this one, and am so pleased with the outcome! I used canned clams because I didn’t like the fresh options I found (and frankly, didn’t want to deal with steaming and shucking multiple pounds, or the expense) and suggest that option, or a similar quantity of frozen clams. If it’s as cold where you are as it is here, my New England clam chowder makes for a comforting, warming winter supper. Heat a Dutch oven or stock pot over medium high heat. Add the oil, warm for 30 seconds, and then add bacon pieces; cook until the bacon is crisp and most of the fat has rendered out, about 5 mins. Use a slotted spoon to remove the bacon pieces to a bowl or plate covered with a layer of paper towel. Remove all but 2 T. of the rendered fat and discard or use elsewhere. Add the onions and celery to the 2 T. bacon fat left in the pot. Cook for about 5 mins, until the onions are soft and translucent. Add the potatoes, smoked paprika, adobo, and pepper; sprinkle with flour. Stir until the spices and flour are distributed evenly; cook for 1-2 mins, stirring constantly. Drain the clam liquid from all three cans into a 4 c. (or larger) measuring cup; **add chicken stock until you have 4 c. total liquid. Add the clam stock mixture to the pot slowly, scraping the browned bits off the bottom as you go. The liquid should just cover the potatoes; add a touch more chicken stock (up to 1 c.) if needed. Bring to a gentle boil, then reduce the heat to medium or medium-low, just enough to maintain a simmer. Simmer for 20 mins, until the potatoes are cooked through. Taste the broth for seasoning. Keeping the heat very low, add the cream, then clams. Heat through without allowing the chowder to boil, just 2-3 mins. Taste again for seasoning. Serve immediately, with reserved bacon crumbled on top. The chowder will keep in the refrigerator, tightly covered, for 3-4 days. *Adobo seasoning is usually available in grocery stores, sometimes in the spice aisle and sometimes in the Latin American specialty foods section. I like the tiny bit of garlic and oregano it adds, but it is optional. Comforting savory broth, for dumplings and more. This post is intended to be more of a guide than a recipe. The ingredients, and quantities of each, change with my mood. Sometimes I want a fiery hot broth and add sriracha until my nose runs and eyes tear up. Other times I want a pronounced garlicky bite, the umami punch of reconstituted dried shiitakes, or the hint of star anise that makes me think of good pho. I use this broth plain, or add noodles, or dumplings (often my spicy pork dumplings), or a great deal of shredded or diced vegetables and herbs. It is a mood-suiting recipe. My hesitation in sharing it until now, a dish I make so often I keep the basic pantry ingredients grouped in a cupboard together, is that I have struggled with how to present the recipe as I think of it, ever-changing and infinitely adaptable, more a method than a measure. However, and especially because I referred to it in my recent post about spicy pork dumplings, this broth is too important to me as a cook not to have in my archives here. I typically use beef broth or chicken/turkey broth, but have had good luck with mushroom and vegetable broth as well. Beef broth stands up to bolder spices like star anise and cinnamon, lots of black pepper and bay leaf; chicken broth tends to be more soothing and delicate, good with extra ginger and scallions. It really is a matter of preference. Pictured below is a recent version made with store brand Whole Foods beef broth, no extra sriracha, lots of garlic, scallions and ginger. I added a dozen frozen spicy pork dumplings and let them heat for about 7 mins. to make sure they were cooked through. It was delicious… and I have enough dumplings left to make more this week, or soon. As I said before: I hope you will treat the ingredient quantities listed below as more of a guide than a strict recipe. Go with what you have on hand, what you’re craving; if you’re delicate with the salty ingredients it’s nearly impossible to make a wrong turn. And once you find the combination(s) you like, I bet this wonderful broth will be as much of a staple for you as it is in our house. Put all ingredients into a large saucepan (except for shiitakes; read directions below) and simmer gently for at least 30 mins. to infuse broth with the flavors you have chosen. Taste and adjust seasoning as needed, especially sriracha and soy sauce. Remember that the saltiness of soy sauce and salt will concentrate as the broth reduces, so be light-handed until you determine the levels you enjoy. Star anise and cinnamon can both be potent, so consider adding them 15 mins. into cooking for a lighter level of spice. Use a cover on the pan to retain more volume; otherwise, the broth will reduce as it simmers. If you’re using dried shiitakes, reconstitute them in hot water in a small bowl or coffee mug for about 15 mins. Slice or chop them and add *with the soaking water* to your broth. Add noodles (pre-cooked if you don’t want them to absorb most of the liquid) or dumplings and heat through before serving. You can also add shrimp, cooked chicken or beef, vegetables that do well raw or lightly cooked (radishes and snap peas, for instance), and fresh herbs like cilantro or Thai basil. Put your chosen extras in a bowl and pour hot broth over the top to keep shrimp from getting rubbery, vegetables from losing their crunch. Strain out the star anise, cinnamon stick, bay leaf and unpeeled ginger before serving. Garlic and scallion can be removed if you want just broth, but I tend to leave them in. 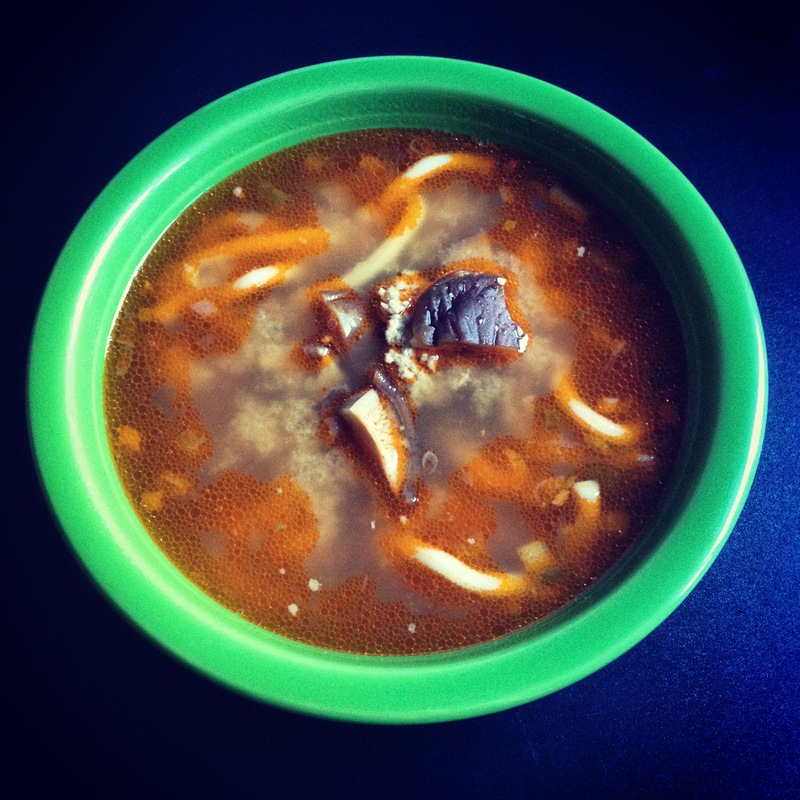 Posted by cookcanread in meat & fish, soup, you can freeze it! This is not the most traditional dumpling recipe you will find… but man, are they good. I make spicy pork dumplings every few months, and should more often than that. For some brain-blocked reason, I imagine the process of filling the wrappers as tedious, and put off making them… only to later shake my head at my own silly stubbornness as I bust out two dozen in less than 30 mins. Perhaps recording my process will help me remember how approachable this recipe really is. I think it takes me longer to chose a bag of premade gyoza in the freezer aisle of my grocery store, and I am never as happy with those. Similar to those frozen gyoza, these dumplings have a tender, savory filling in a delicate wrapper, and I usually steam or boil them and serve in a simple broth. I am terrible at the pan-frying method of making gyoza and have never deep-fried them at home, though either method would work to cook these dumplings. The filling is a little spicy from the sriracha, and I do use a liberal amount; you can tone it down a little by halving the amount of sriracha. I don’t recommend leaving it out, as the acidity and taste of the sriracha is more important than the heat here. As it is tempered by other ingredients, and especially if served in broth, I have been known to *double* the amount of sriracha to achieve the spice level I prefer. The dumplings also have a hint of garlic, a good amount of fresh, green scallions and just a bit of nutty toasted sesame oil to complement the mild pork and fiery sriracha. Sometimes I add some finely shredded cabbage to the filling when I want to add even more texture than the scallions provide; if you’d like to try that, I recommend starting with about 3 T. and using Napa cabbage. You’ll need a few extra wrappers to account for the increased volume of filling. Spicy pork dumplings can be frozen, and I highly recommend that you do– I like the way they cook when I add dumplings right from the freezer into simmering broth. Alternately, make them fresh and cook them right away, but remember how very delicate they are when you’re working with soft, fresh dumplings. Whether you double the recipe and make a bunch to have on hand, or reach for this recipe to use up leftover pork from another meal, do try making these spicy pork dumplings. I’m always glad when I realize I have some in the freezer, ready for dinner in minutes. I’ll share my favorite broth recipe soon! Mix all ingredients except for the wrappers in a medium bowl. Do it by hand; it’s not difficult and the results are far superior to using a mixer. I like to keep a little texture by leaving the scallions chopped instead of minced. The filling can be refrigerated for a day or two if you need. Set up a work station: a clean board, a small dish of room temperature water and a plate for your completed dumplings. In the picture above you see that I use a dumpling folder, which is fun and helpful but not required to make these! The main benefit is that I get the pretty crimped edges, but honestly, I usually skip it and pinch them closed by hand. Working with one wrapper at a time, wet your finger (or a small pastry brush) and run it around the edge of the wrapper. Place a small amount of filling, about 1 generous tsp., right in the center of the wrapper. You will have to do a few to get the hang of how much filling to use, and I hesitate to specify an amount because of the variance in store-bought wrappers. If you use too much filling, the edges won’t seal properly and you run the risk of the dumplings bursting before or during cooking. If you don’t use enough filling, you might have air pockets in the dumplings that also lead to breakage. The best advice I can give: trial and error. With the filling centered, fold the wrapper in half and press firmly to seal the edges. The dumpling folder will make a pretty edge, or you can crimp by hand, or use a fork, or just pinch together and leave the edges “plain”. As long as the edges are sealed, you did it! Once you get the hang of the process, start working to minimize air bubbles by pressing the wrapper around the filling gently before completely sealing the edges. Continue until your filling is gone. This recipe as written above makes 20-24 dumplings. I consider a serving size to be 5-6 dumplings, so this makes about 4 servings. As I mentioned, I think the dumplings cook best when frozen. Lay the finished dumplings in a single layer on a cookie sheet and freeze for 2-4 hours; you can then transfer them to a sealed bag or container for long-term storage. Dumplings keep up for several months in the freezer. Steam, gently boil in a flavorful broth (my recipe coming soon! ), or pan fry like gyoza to serve. *I use wonton and gyoza wrappers interchangeably; as far as I can tell the primary difference is round versus square, and these dumplings can be triangular instead of a crescent with no forseeable consequences. A supermarket near us has an extensive selection of Asian specialty foods and I find the wrappers in the refrigerated case there. I usually buy two packs of 40-50 wrappers and toss one in the freezer to use later. I almost saved this one for Valentine’s Day… but I didn’t want to wait. Yes, I am now going to give you a recipe using beef heart. Beefalo heart, if I’m being specific, since that’s what I have to work with. When we bought our beefalo share last spring, I was curious enough about cooking offal to ask for some from the butcher. At $1 per pound, it was a deal I could not pass up, and a good opportunity to try something I might not otherwise have access to… or the willingness to seek out. In my portion of beautiful grass-fed, organic beefalo roasts, steaks and ground, I also got a tongue, liver and two hearts. Except… what I thought was liver was actually two MORE hearts. Oh boy. I had absolutely zero idea how to work with beef heart; I don’t know that I had ever had or even seen it before. And I’ll be honest here: we got our meat share last spring, and there’s a reason I have had these hearts for months in the freezer. It took me a good amount of time to work up the courage to actually cook heart. I enjoy liver… as long as it’s chicken liver… and I usually leave the cooking to my husband or a restaurant. I prepared tongue once, in the one tongue dish I know and like (which is lengua tacos), and that took some nerve, too. I started thinking about why I was so determined to cook “the nasty bits”, a term I dislike but understand. Is it the stubborn (or boastful…) desire to say I have done so? Is it common sense because they were $1 per pound and are lean and nutritious? Is it due to my adventurous, try-all-the-ingredients palate? I think it’s a little of all those things, but also a desire to go all the way with my personal philosophy that we should only eat animals that have been treated fairly and humanely, as I know these beefaloes were, and we should honor those animals by not wasting any part of what they provide to us. Call me a hippie, or something else, I don’t care– I think waste is a shame. My hatred of waste is stronger than my squeamishness about preparing organ meat. So let’s figure out to do with those hearts, shall we? My first instinct was stew. I like stew; it is versatile and comforting and easy to prepare. When it comes down to it, once I got past the name, heart is really not too much different than many cuts of beef I prepare for stew without a second thought. It is a muscle; the texture is familiar. It responds well to a long braise and works with traditional goulash flavors of onion, carrot and garlic the same way a chuck roast or equal amount of stew beef would. Ask your butcher to cut them for you and you might not even have to worry about trimming the hearts, which was the most challenging part for me. Once it was cubed, it looked like any other meat I have ever cooked with. My goulash, flavored with caraway, thyme, coriander and a healthy amount of Hungarian paprika, as well as sweet carrots and parsnips (my favorite part! ), is a warm and satisfying winter meal. It was fantastic served with egg noodles and a dollop of sour cream and I bet it would be equally good with potatoes. I made it in the slow cooker while doing other things around the house; I just had to do a little bit of prep, wait five hours and then boil some egg noodles to get a delicious Sunday Supper on the table. Beef(alo) heart is lean, flavorful and economical. For this meal, I paid about as much for the broth as I did for the meat! I’m guessing the price of the package of egg noodles was probably close to what I spent on heart, too. I will use beef or beefalo heart again for stews like goulash and, if I am ever lucky enough to find one fresh, would love to try it grilled. It is supposed to have a texture and flavor similar to hangar steak, which is one of my favorites. Check your local butcher shop or with a meat purveyor at your farmers’ market for buying options if you’d like to try cooking heart at home. You might be surprised how similar it is to roast beef, or steak– it certainly makes a heck of a goulash. Heart-y and delicious. Heat the oil in a heavy-bottomed skillet, Dutch oven or cast iron pan over medium-high heat. Season the cubed meat generously with salt and pepper and add to the pan in a single layer; cook, without stirring, for about 5 mins. Turn the chunks and cook 5-7 mins. longer to brown at least one more side, then remove with a slotted spoon to a plate or bowl. Repeat this process, adding more oil to the pan if necessary, until all of the heart is browned. This step adds so much flavor; I do not recommend skipping it. Add the onion, garlic, carrots, parsnips and browned meat to your slow cooker. (Mine is a 6 qt. model.) Sprinkle the paprika, caraway, marjoram and coriander over the top and mix to combine. Add the broth, fresh thyme and bay leaf. Cover and cook on HIGH for 5 hours. Add the tomato puree, stir, and cook for another 30 mins. to an hour. Taste for seasoning, adding salt as needed. Remove the bay leaf and woody stems from the thyme. You can serve immediately: ladle a portion of meat and vegetables over cooked egg noodles or potatoes, top with some broth and a dollop of sour cream. Alternately, dish the heart and vegetables into a bowl and serve family style, with sour cream and noodles or potatoes alongside, as desired. The broth can be served right from the slow cooker, or ladled into a shallow skillet, brought to a boil and thickened with 1 T. cornstarch dissolved in 2 T. cold water to make a gravy. Both options are flavorful and delicious! Leftover goulash is wonderful reheated the next day and will keep in the refrigerator for up to 3 days. *The beefalo hearts I have from the butcher came pre-trimmed, with just a thin layer of fat. Because the cut is already so lean, I left most of the fat alone and made sure to brown the chunks fat side down to render as much as possible. As for trimming, I cut out some of the very obvious tendons, but did not do much else, since I was already cutting it down for stew. There are plenty of guides online if you need help butchering; I found this link especially useful. At first, I didn’t know what to call this. 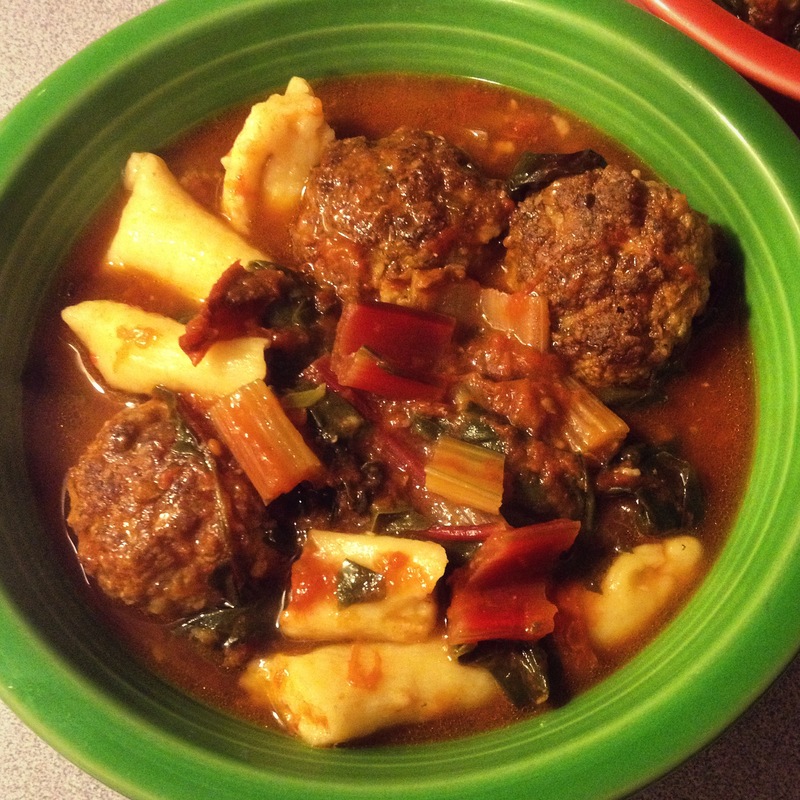 It’s a veritable mash-up of three other meals I like a lot: soup with tomatoes and Swiss chard, spaghetti and meatballs, and gnudi with greens. When I thought about how I could best explain what the ideas were that spurred me to make it, I keep coming back to the word stew. Essentially composed of a jar of home-canned tomatoes, braised chard, delicious pork meatballs and delicate ricotta gnudi, I think ‘Italian meatball stew’ is the simplest, best description. I wanted the impression of comforting, all-day-simmer goodness and a ratio of chunky ingredients that was equal to or greater than the broth component. I also wanted a meal that could be simplified enough to make even on the busiest night. I got everything I wanted, and created a dish so good we spent most of dinner discussing what else we could add (mushrooms! leftover rice in place of pasta? artichoke hearts!) and how many times a week we could justify having this for dinner. I happened to have some gnudi dough ready to go, but this could be made with store bought gnudi or gnocchi or any other noodles you enjoy. I think tortellini would be especially good. The meatballs are tender and so easy to put together; I used ground pork and would also recommend turkey, ground beef or a mix. Swiss chard is always in my refrigerator, and I love how it tastes with tomatoes and how it holds up in soup, but any dark greens would be at home here: spinach, kale, even broccolini or rapini. I am so jazzed about this stew and foresee many bowls on my dinner table this winter. It is even better left over! With time for the ingredients to meld, the stew takes on a new depth. With elements that are easy to make ahead or buy premade, this can plausibly be a 15-minute dinner, but it tastes like you stirred and chopped for hours. Impress your family today. Start by making the meatballs: in a large mixing bowl, combine all ingredients and mix (preferably by hand). Don’t overmix; you’re done when the dry ingredients are incorporated and the mixture looks uniform. You should be able to form a ball that holds its shape; if your mixture is too wet, add more breadcrumbs a few tablespoons at a time, but be careful not to go too dry. Form 14-16 uniform meatballs with a scoop or your hands. Heat 1 T. olive oil over medium heat (you can use the pot you plan to make the stew in so all the flavor stay put) and brown the meatballs in two batches, turning at least once, for about 8 mins. per batch. They *will not* be cooked through but will finish in the stew. Set aside. To make the stew, heat 1 T. olive oil in a large soup pot or Dutch oven over medium heat. (You can continue with the same pan you used for the meatballs, and may not need to add more oil.) Saute the Swiss chard stems for 1-2 mins. Add the chopped leaves and stir, then cover and allow to wilt for about 3 mins. Stir in the tomatoes, broth, pepper and salt; cover again and reduce the heat to medium-low. Simmer for 8-10 mins. Stir in the vinegar and adjust seasoning, if necessary. Place the meatballs in a single layer in the stew and gently stir so they are coated in sauce but remain whole. Cover again and cook for 8-12 mins. to ensure the meatballs cook through. Gently stir in the cooked pasta, heat for just a minute to make sure everything is warmed through, and serve. Leftovers will keep in the refrigerator for up to 5 days. 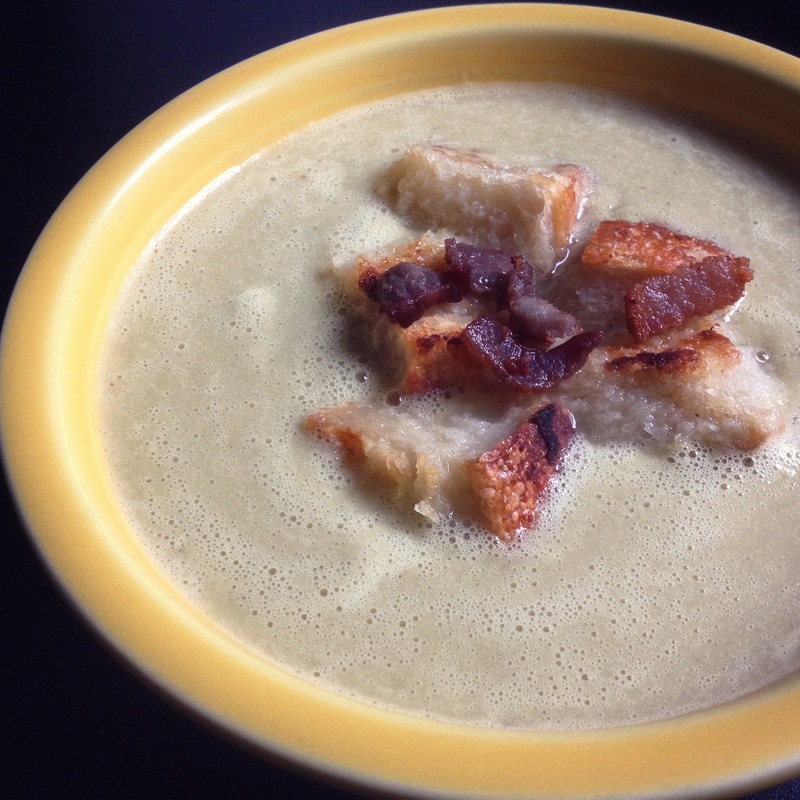 Celery soup with horseradish croutons. Poor celery. It’s such a behind-the-scenes vegetable. Important for mirepoix, but not the star; necessary for adding texture to chicken or tuna salad, but not the star; a crucial vehicle for cream cheese or peanut butter in ants on a log, but not the star. When will celery be the center of attention? Right now! In this surprisingly hearty celery soup, which I’ve been making all winter, celery is the star. Well, kind of. It was, until I thought horseradish croutons might be a nice thing to try. Lucky for us, celery doesn’t mind sharing the stage, and so it will here, once more– but it definitely gets equal billing with those fabulous croutons. This is not the celery soup you reconstitute from a can or mix into casserole. 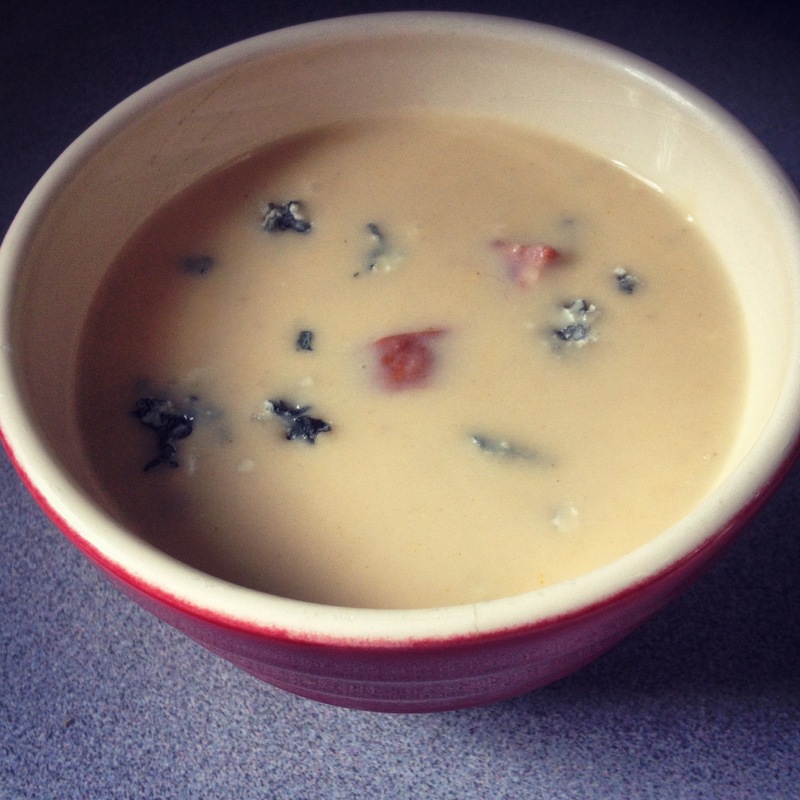 Without an ounce of dairy, this soup is silky, nuanced, comforting and incredibly flavorful. There’s a reason we use celery as a base layer in so many classic dishes– it’s delicious! With a few key ingredients to support and deepen the flavor– bacon for saltiness and crunch, shallots for sweetness– celery soup has quickly become one of my very favorites. Now that horseradish is in season and abundant in the market, I look for an excuse to use it whenever possible. As I reached for the bacon to start a pot of celery soup, I noticed the horseradish root I had in the refrigerator and remembered how much I love those two flavors together. I came up with the idea of making croutons flavored with horseradish to add another layer of flavor to my soup. Was that ever a good idea! The croutons, as they soak up warm soup, soften to add another element of creaminess; the hint of sharp horseradish complements both the bacon and the sweet, grassy celery. 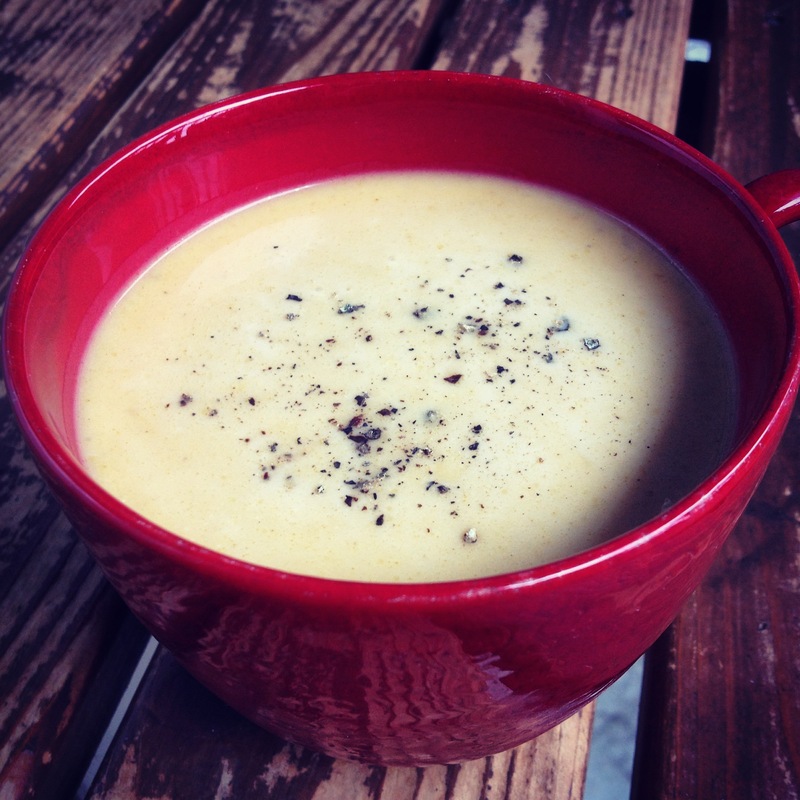 It’s such a craveable combination of flavors, colors, textures… I just love this soup. The croutons are great on their own, too, added to a nice spring salad or made smaller to top a casserole with chicken, or macaroni and cheese. Once you make this soup, you’ll never think of celery quite the same way. 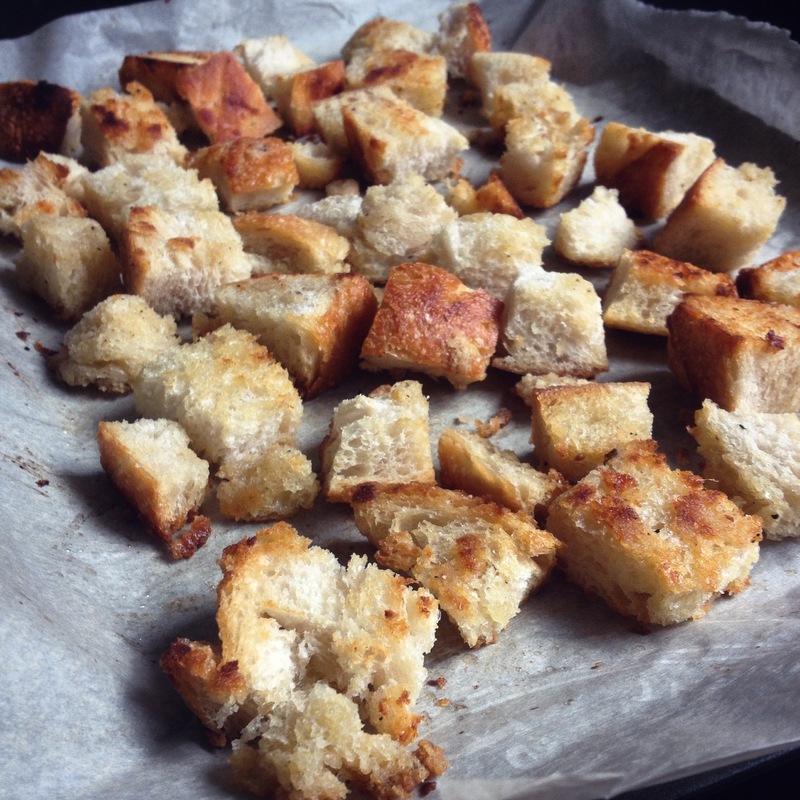 Just writing about it has me craving a bowl… I hope I have some bread for more croutons! Start by making the croutons, up to 2 days in advance. Preheat the oven to 375 degrees and cover a baking sheet with parchment or tin foil. Add the butter and olive oil to a small saucepan and warm over medium heat just until the butter is melted. Remove from the stove and add the pepper, salt, cider vinegar and freshly grated horseradish; stir to combine. Spread the cubed bread on your prepared pan and slowly drizzle half of the butter mixture over the top. Use a spatula to flip and stir the bread, then drizzle the remaining butter over the top. Bake for 10-12 mins., stirring and flipping the bread cubes after 5 mins., until the croutons are golden brown and slightly crisped. Set on the counter to cool while you make the soup. Heat a large saucepan or Dutch oven over medium-high heat. Add the lardons of bacon and cook, stirring occasionally, until crispy. Use a slotted spoon to remove the bacon from the pan to a towel-lined plate; set aside. If you have more than 2 T. (estimated) of bacon fat left in the pan, pour off the excess; if you have less, add olive oil to make up the difference. Add the minced shallot to the pan and lower the heat to medium; cook for about 3-5 mins., until softened and fragrant. Add the celery, and leaves if using, to the pan and stir; cook for an additional 5 mins. Add a splash of broth to the pan and use a wooden spoon to gently scrape any good browned bits off the bottom, then add the rest of the broth. Bring to a boil, lower the heat back to medium-low and cover; simmer the soup for 20 mins. Remove from the heat and use an immersion blender (or carefully transfer to your Blendtec or equivalent) to process the soup until it is silky smooth. If you are concerned about strings from the celery, pass the soup through a mesh strainer at this point. Return to the pan and warm gently, just until heated through. Add salt & pepper to taste; keep in mind that both the bacon and croutons will add salt, so be judicious. To serve, ladle a generous amount of soup into each bowl. Float 5-6 croutons (or as many as you like) in the center and top the croutons with some reserved bacon. Serve immediately. If you have leftovers, you can add the reserved bacon to the soup and refrigerate, but keep the croutons separate. *I am a horseradish fiend and like a lot. Start by adding 1 T. horseradish to the mixture, let it sit for a moment, and taste with a piece of cubed bread. If you want a stronger flavor, add more horseradish. 2 T. is perfect for me, but horseradish can be very strong or very mild, root to root. It’s always a good idea to taste your food and make adjustments. Smoky potato & linguica soup. I didn’t know it was possible to make potato soup that wasn’t thick as oatmeal, but I did it. For years, my husband has loved the creamy potato soup I make with bacon and scallions, topped with a sprinkling of cheddar or sometimes bleu cheese. I guess you might call it a “loaded baked potato” soup. Confession: I dread his request for that soup. I find its heaviness so unwelcome that it cancels out how good it might taste; flavorful as it really, really is, I don’t like wading through a bowl. But let’s get back to the positive news now: this is not that loaded soup. My new version of potato soup is lighter– it can almost be described as ‘brothy’– and just as delicious, maybe more so. The lightness comes from the cooking method: I essentially steam-boiled the potatoes rather than allowing them to cook down and thicken in the broth. I also took care to choose a variety that isn’t overly starchy; in this case, that was a Yukon gold, but I’ve also had luck with thin-skinned red potatoes. The soup gets a lovely smoky flavor from my current favorite ingredient, linguica, and paprika; linguica is a mildly spicy smoked sausage notable for its perfect balance of sweetness and smokiness. It reminds me of taking a bite of kielbasa and Andouille sausage at the same time and I love how it adds so much flavor to this soup. The list of ingredients is short because the linguica does so much work for you. Linguica can be found in most well-stocked groceries near the bacon and sausage; if you can’t find it, a smoked sausage or kielbasa would be a reasonable substitute. Finally, a few bits of nutty, decadent gorgonzola cheese round out the flavors and add the perfect finishing touch. In the heart of winter, whether you’re watching another snowfall or just looking at a gray sky, a bowl of this smoky potato & linguica soup is just what you want to eat. Heat the olive oil in a large stockpot or Dutch oven over medium-high heat. Add the linguica and cook until it begins to brown and release its oil, about 4-6 mins. Using a slotted spoon, remove the linguica from the pan to a small plate or bowl. You should have about 1 T. of oil left in the bottom of your pan; if you have more, pour it off. If you have less than 1 T., add more olive oil to compensate. Add the onions to the still warm oil and cook for about 5 mins., stirring once or twice, until they soften and start to become opaque. Add the diced potatoes and paprika to the onions and mix well to coat the potatoes. Cook for 3-5 mins. without stirring. Add about 1/2 c. of broth (estimate, no need to measure) to the potatoes and use a wooden spoon to scrape all the good flavorful bits from the linguica and seasoned potatoes from the bottom of the pan. Add the rest of the broth and bring the soup to a slow boil. Now, here is the key: reduce the heat to medium-low and cover the pot. Cook for 25 mins. ; check the potatoes for doneness by mashing one or two against the side of the pot. They will mash easily, with little pressure, when they’re cooked. When the potatoes are done, remove the pot from the heat and add the cream. Use an immersion blender to carefully blend the soup; use short, pulsing bursts to avoid an unpleasant, gluey consistency. I don’t recommend using a blender or food processor because the consistency can go wrong so quickly. If you don’t have an immersion blender, use a potato masher and call your soup rustic. Once the soup is blended, add a few good cracks of black pepper and a pinch of salt. Be judicious with salt, since the linguica and gorgonzola will introduce some saltiness to the mix. Reheat on a low burner if necessary, then ladle into bowls and garnish with cooked linguica and crumbled gorgonzola, to taste. Serve immediately. This soup is also surprisingly good cold, if you’d like to try something different. Roasted broccoli soup with goat cheese dumplings. Rustic. Homestyle. Comfort food. These are the words I would use to describe my new broccoli soup recipe, which took a distinct left turn from the dish I envisioned when I was first jotting down notes. I think many people think of cheese in tandem with broccoli in soup, but how many folks think chevre? While cheddar is usually the star of that show, goat cheese, especially fresh chevre, is well-suited to a pairing with broccoli and even better suited to be featured in dumplings. I pictured a delicate, brothy soup, flavored by the roasting process and a little squeeze of lemon juice at the end, with tender dumplings floating lazily about. 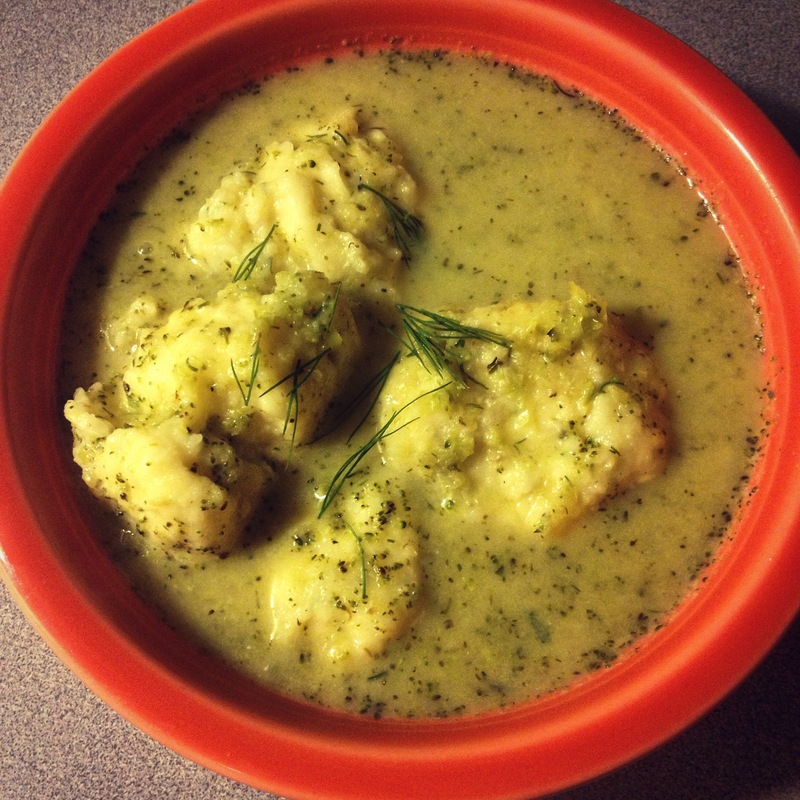 Instead, I got a rich soup, flavored by roasted broccoli and shallots, brightened by lemon and dill, surrounding tender, creamy dumplings. This is how it should have been all along. I chose to cook the dumplings in broth and use that same broth, clouded as it was by pieces of dumpling and strands of dill, to finish my broccoli soup. Why did I do this? Two birds with one stone: extra flavor in the dumplings from the broth and thickener for my soup from the bits of dumpling! Always thinking, I am. If you’d like to try a thinner, brothier soup like I first imagined, cook the dumplings in lightly salted water and use the broth for soup purposes only. Without the floury bits of dumpling dough, the soup won’t thicken in the same way. You could also make the soup without dumplings, if you’re concerned about dairy or gluten or just craving a lighter broccoli soup. Lastly, if you want to play up the heartiness of the dumplings, add additional vegetables like peas or cooked carrots (after you puree the broccoli), or cubes of pre-cooked chicken. What you have in this recipe is a meal reminiscent of old favorites, particularly broccoli cheddar soup and traditional chicken and dumplings, but new and bright and interesting. The depth of flavor from roasting the vegetables, the creaminess of chevre, the classic duo of dill and lemon to keep your palate awake– no strange combination or juxtaposition of flavors here, just familiar ingredients put together in a new way. I think these goat cheese dumplings might show up in other soups I make, because they are great, but I will always think of this broccoli soup as their proper home. Start by roasting the vegetables. Cut the broccoli crowns into florets; keep them similar in size but don’t fret too much about them being exact. Shave the tough outer layer of the stems off with a vegetable peeler and cut into cubes similar in size to your florets. Cut small shallots in half and large ones in quarters; toss broccoli pieces and shallots with olive oil, a generous pinch of salt and a few good cracks of black pepper. Spread on a cookie sheet or similar roasting pan in one even layer and roast at 375 for 35 mins. The vegetables are done when the shallots have softened and the broccoli florets have some color and crispy edges. Set aside. Next make the dumplings. (This can be done while the vegetables roast or up to a day ahead.) Combine flour, baking powder and 1/2 tsp. salt in a large mixing bowl and stir to combine. Add the milk, egg and fresh dill and stir until you have a uniform ball of dough. The dough will seem floury at first– keep at it with a wooden spoon until all dry ingredients are incorporated. Crumble the softened goat cheese over the dough and stir to incorporate. It’s okay if some streaks of chevre are still visible in the dough. At this point, you can wrap the dough and refrigerate for a day or proceed with forming and cooking the dumplings. Pour the broth into a large pot and bring to a simmer. 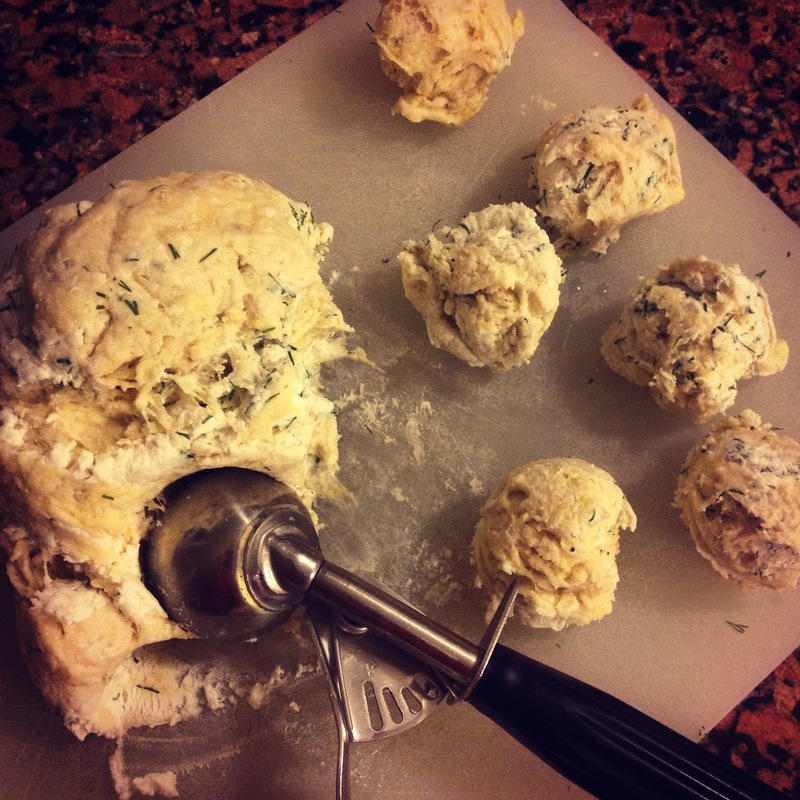 Using a 2 T. cookie scoop, soup spoon or your hands, make golf ball sized dumplings. Drop the dumplings into hot, simmering (not at a vigorous boil) stock in a single layer; depending on the size of your pot, you may need to work in batches. The dumplings will sink and then float; cook them for 3 mins. after they float and remove promptly to a plate. Repeat this process until all dumplings are done; you should end up with 10-12. Set them aside and reserve the broth! Don’t strain it or anything. Add the roasted broccoli and shallots to the reserved broth. Don’t be bothered by the remnants of dumpling– they are your secret thickening agent. Bring to a gentle boil and cook for about 5 mins., until you see the broth beginning to thicken. Remove the pot from the heat and cool slightly before pureeing the soup with an immersion blender, or use your Blendtec. Be careful! Hot soup is hot. Return the pureed soup to the pot and stove; add the lemon juice and taste for seasoning. I like a lot of pepper in this one and recommend at least a little more of that. Add the cooked dumplings to the pot and heat gently, just until warm. Serve immediately– a few dumplings into each bowl, topped with a generous ladle of soup– and garnish with a sprig of fresh dill if you like. This soup is wonderful left over and will thicken significantly if the dumplings are stored with the broccoli soup. I like that a lot; it becomes almost like a good casserole. If you’d rather keep the soup soupier, consider separating the broccoli soup and dumplings into different containers before refrigerating. Spicy pork & miso soup with udon noodles. I am barely exaggerating when I say I could eat this spicy soup for dinner every single night and be happy. Perhaps I would take an occasional break to acknowledge Meatless Monday; perhaps not. Would I miss old friends like mashed potatoes, spinach pie and lamb burgers? Sure. But I would have a bowl of delicious soup to ease my pain. Kidding aside, this is my perfect bowl. It is salty because of the broth and miso, sweet from the pork, spicy thanks to gochujang, umami from mushrooms and that lovely miso, comforting because it is brothy, interesting because of the multiple textures going on. It is even better on the second day, a factor becoming increasingly important as our calendars crowd and I try to make dinners ahead to be reheated. It is malleable: perhaps you want turkey or tofu instead of pork, or you have a tiny bit of Andouille sausage left from another meal that you think might just do the trick. (Spoiler: it does.) Maybe gochujang is not your thing– you prefer sriracha or no heat at all. Not a problem. Some of the ingredients may be new to you, but all should be available in a well-stocked supermarket or local Asian market. Though I was initially intimidated by miso, I find it to be a versatile pantry ingredient now, useful for a quick bowl of broth at lunchtime, my new favorite salad dressing or a rub/sauce for salmon. I add mirin to all manner of noodle dishes and stir fries, and use gochujang to make marinade for chicken wings, season beef jerky and jazz up roasted cauliflower. Even if making this soup means a few extra items on the grocery list, I think you’ll get good use from them– plus, if you’re as smitten as me, you’ll probably want to make the soup multiple times! The original recipe, link below, called for additional flavors including a boiled egg and sesame seeds. I think either or both would be nice, and I like a few leaves of cilantro to garnish my bowl sometimes. Make the soup your own with additions or subtractions and know that you have a warming, filling, easy meal to add to your winter rotation. Place the shiitake mushrooms in a large mug or small bowl and cover with boiling water. Allow to soak for 15 mins. ; remove the mushrooms and slice into strips or dice into 1/2″ pieces. Set aside. Reserve 1/2 c. of soaking liquid to use in later steps. In a large skillet or Dutch oven, heat the canola oil over medium heat. Add the ground pork, breaking it up into small pieces with a wooden spoon or silicone spatula, and cook until brown. Add the ginger and gochujang to the browned pork and mix; cook for a minute or two. Add the mirin, soy sauce, pepper and reserved soaking liquid and bring to a boil. Lower the heat slightly and cook, stirring constantly, until the liquid reduces almost completely, about 5-6 mins. Don’t let the mixture dry completely; stop cooking when it looks like cooked pork with 1/4 c. or so of liquid added. Mix in the green onions, then add the stock, raise the heat slightly and bring to a boil. Once boiling, add the shiitake mushrooms, lower the heat again to just below medium and simmer, uncovered, for 8 mins. Put the miso paste in a mug or small bowl and ladle hot broth over it, about 1/2 c. or so. Mix gently to break up the miso and create an even, thick sauce. It will look grainy, which is fine. Add the miso mixture to the soup and stir to combine. Add the udon noodles and continue to cook just until the mixture is warmed through, about 2-3 mins. Use tongs to put noodles in the bottom of each serving bowl and then ladle the broth, pork and mushrooms over the top. Serve immediately. Leftovers, covered tightly, will keep in the refrigerator for several days. *1 T. of gochujang makes for a fairly spicy bowl, which is great for me but sometimes too much for other folks, like my poor husband. Recently, I’ve been making the recipe with about 1 tsp. gochujang and adding more to my own bowl just before eating. If you don’t have gochujang at home, substitute sriracha, 1 tsp. at a time, to taste. The soup is also wonderful with no heat, but I would recommend adding a little of something, just for interest. **Udon noodles are available fresh or frozen, packaged in individual serving pouches or large bags. I have been buying fresh 7 oz. packets and use two for this recipe. When I buy a large bag, my measurement is “two handfuls plus some more”, which is completely unhelpful to you, but is visually the same as 14 oz. The good news? A little more or less will work just fine. Pumpkin soup with toasted spices. This is a peaceful pumpkin soup. It’s the kind of meal you want to eat from a mug, with your hands wrapped around to hold in the warmth and your face bent forward to catch the steam and aroma of spices. It’s a respite from the rich, heavy foods so prevalent in December. Preparing a pot is physically calming, compared to the fraught thermometer-watching of candy-making or the constant scoop-rotate-check-cool-repeat of cookies. The process feels like a recharge, a quiet moment in the kitchen. So there you have my emotional reaction to pumpkin soup. (Who knew a humble soup could have such an effect?) But the words are true! Lately, when I’m going in fifty directions with a to-do list that’s longer than I care for, this is what I want to make and certainly what I want to eat. I like the ritual of toasting and grinding the spices with my trusty mortar & pestle. Inspired by my favorite flavors in both Indian and Thai curries, as different as they usually are, it’s nowhere near the spice level of a traditional curry from either cuisine. The uncommon combination of creamy soup with pungent spices is comforting, but I’ve taken care not to let the spices overpower the pumpkin. My soup is filling, flavorful and adaptable to suit vegan or dairy-free guests at a dinner party. I’ve made it vegan and dairy-free with vegetable stock and coconut milk (no fish sauce) and, when I didn’t have coconut milk in the house, an equally wonderful version with chicken stock and whole milk. It is elegant enough to work beautifully as the first course on an extensive menu and simple enough to make as a weeknight meal on the fly. The first few weeks of December have passed in a blur. If you’ve been to more holiday parties than you can remember (ahem); eaten (or baked, or both) more cookies than you can count; wrapped more gifts than you have room for under the tree– this soup is for you. Put it in a nice big mug, wrap your hands around it and take a minute to just breathe. And eat. To your dry stockpot or Dutch oven, add the coriander seeds, cumin and cardamom seeds. Toast over medium heat, swirling the pan frequently to discourage burning, until you can smell the spices and notice a slight browning of the cumin. Transfer to a spice grinder or mortar bowl and grind to a fine consistency. To the same stockpot/Dutch oven, add olive oil and increase the heat slightly to medium-high. Saute the leeks until soft and starting to become fragrant; it’s not necessary to melt or brown them. Add the ground toasted spices, cinnamon and ginger and stir until coated. Cook the spices and leeks another minute or two, then add in the pumpkin puree and mix. Whisk in the stock, an eyeballed cup or so at a time, until all the stock is incorporated and you have an even mixture of pumpkin and stock. Bring the soup to a gentle boil, lower the heat to low and barely simmer for 30 mins. Since all the ingredients are cooked at this point, you’re mostly reducing/thickening the soup and accentuating the spice flavors. (If you want to simmer longer, cover the pot so the soup doesn’t over-reduce.) When you’re ready to eat, remove from the heat and puree with an immersion blender until smooth. Add the coconut milk (or whole milk), salt and fish sauce, if using. (Remember that fish sauce can be salty.) Return to the burner just until the soup is heated through; taste and adjust seasonings, if necessary. Serve hot, garnished with a few grinds of black pepper. *The pumpkin puree can be from a pumpkin you roasted or from a can, but should not be pumpkin pie mix. Categories Select Category baking beans & legumes beverages books bread candy & sweets cheese chocolate condiments cookies & bars dessert eggs frozen treats fruit herbs meat & fish noodles nuts, grains, pasta other thoughts products put it in a jar restaurants sauces soup spice vegetables you can freeze it!